American Health Packaging introduced a new line of liquid unit dose cups- Fluoxetine Oral Solution in order to expand their product types. Rovipharm and RR Plastiques acquired by Stiplastics S.A.S. 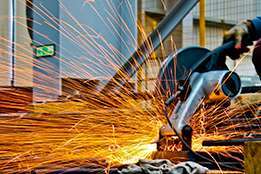 to strengthen the position of manufacturing surgical and medical instruments. The growth of the global oral dosing cups market is thriving on the back of the worldwide demand for generic and low cost medicine. 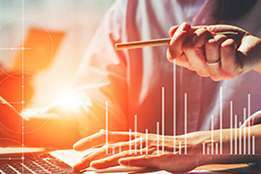 In addition to that, the demand in the terms of capacity, effectiveness and quality are continuously increasing. Various material and designs related to oral dosing cups are executed to minimize the cost to adhere to generic medicinal demand. 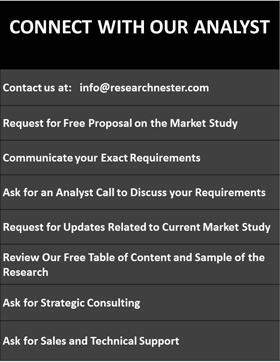 Moreover, various beneficial factors such as rising prevalence of lifestyle diseases, higher smoking generality amongst European countries and increasing government stakes in healthcare industry across the globe exhibits notable growth in pharmaceutical industry and complementary markets such as oral dosing cups. Global oral dosing cups market reached USD 270.11 Million in 2017 and is expected to garner USD 416.27 Million by the end of 2025 by registering a CAGR of 5.72% across the globe over the forecast period 2018-2025. Further, the worldwide market of oral dosing cups is anticipated to achieve a Y-o-Y growth rate of 6.81% in 2025 as compared to the previous year. The global oral dosing cups market is segmented by regions into North America, Latin America, Europe, Asia-Pacific and Middle East and Africa. 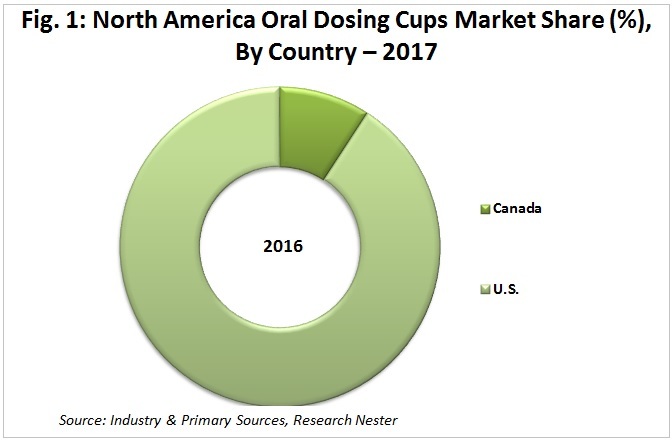 Among these regions, the market of North America oral dosing cups is driven by U.S. and Canada, where U.S. held dominant market share of around 90% during 2017. The increase in the investments by the U.S. government and higher healthcare expenditure of government of Canada signifies constant growth of pharmaceutical industry and predicts a significant growth of oral dosing cups market in upcoming years. Additionally, North America is expected to expand by observing the growth rate of 1.44x over the forecast period, which in turn is estimated to have a positive effect on the demand for oral dosing cups products in the long run. 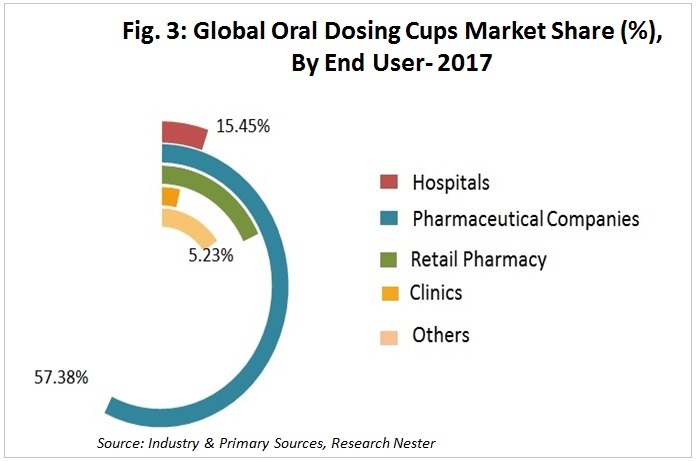 Further, China, Japan and India are the prominent countries that are driving the growth of the Asia Pacific oral dosing cups market, where China accounted for the largest market share of 32% in 2017. The expansive pediatric population in India, China, Bangladesh, Indonesia, and various other nations in the region along with the increasing geriatric population in countries such as Japan and China signifies the discernible growth in Asia Pacific oral dosing cups market. The global oral dosing cups market has been segmented on the basis of product type into disposable and re-usable. 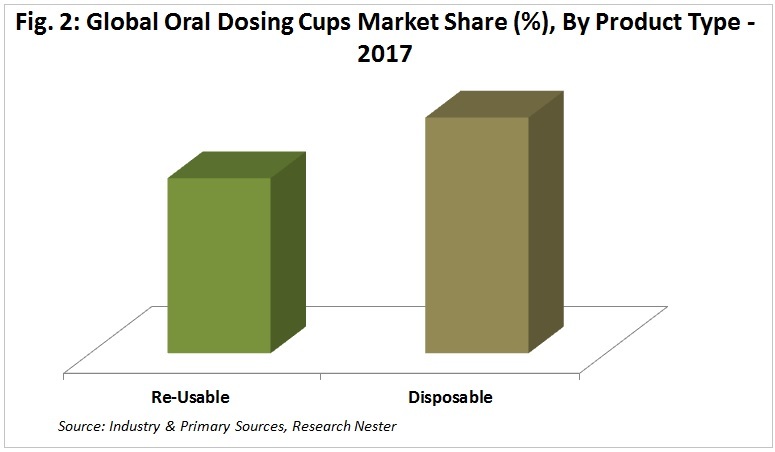 Disposable segment with 57.36% share in 2017, occupies the largest market of oral dosing cups across the globe. 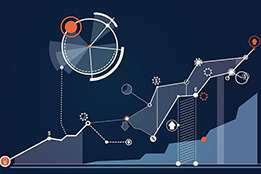 Additionally, disposable segment is anticipated to cross USD 230.0 Million by the end of 2025 and is anticipated to flourish at a CAGR of 5.38% over the forecast period. Further, the re-usable segment is estimated to grow with highest CAGR of 6.16% over the forecast period. Global oral dosing cups market is also segmented on the basis of end user into hospitals, clinics, pharmaceutical companies, retail pharmacy and others comprising of ambulatory surgical centers, diagnostic centers, etc. It is observed that there is a high demand for oral dosing cups driven by pharmaceutical companies making this a part of the overall packaging for their liquid formulation drug to allow accurate measurement for dosing. Various large pharmaceutical industries in several developing regions such as India, Brazil and Mexico predict a significant elevation in the utilization of oral dosing cups. 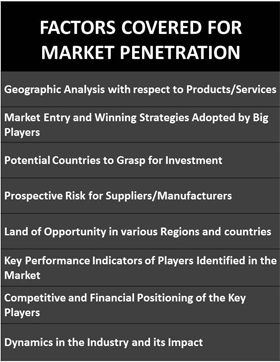 The pharmaceutical companies segment captured 57.38% of the total market share in the global oral dosing cups market in 2017 and is expected to reach significant market valuation by 2025. In addition, hospitals segment is increasing their expenditure on dosing cups and is predicted to capture around 14% of the market share in 2025.. Further, rising awareness is increasing the acceptance of high quality and branded dosing cup among end users which is driving the manufacturers to develop and meet the demand for efficient dosing cups. The global oral dosing cups market is segmented by capacity into 2.5ml-15ml, 15ml-30ml and >30ml. Among these segments, the 2.5ml – 15ml segment is estimated to be a major contributor to the global oral dosing cups market throughout the forecast period. Further, increasing investment from various governments globally is anticipated to catalyze the growth of the global oral dosing cups market over the forecast period. Several policies devised by the government from several countries such as U.S., India and several European nations to enhance and provide the healthcare support to the citizens is anticipated to bolster the global oral dosing cups market. The introduction of Affordable Care Act. by the U.S. government and budget allocation for Ayushman Bharat-National Health Protection Scheme by government of India are among several alterations by authorities from various governments to aid the health care sector exhibiting a positive growth in the healthcare industry and significantly catalyzing the global oral dosing cups market . Further, rising pediatric and geriatric population coupled with their dependency on medicines is expected to impel the growth of the oral dosing cups market. Additionally, rising healthcare expenditure to address the growing disease incidence rates is also believed to aid the oral dosing cups market to grow in near future. The alternative delivery products such as syringes, droppers, and cylindrical spoons combined with the accuracy related to the oral dosing cups are some of the major factors that are limiting the growth of the oral dosing cups market around the globe. Beside this, companies are also making various efforts to expand the business of oral dosing cups to meet increased demands. For instance, in response to increased demand for safe, accurate dosing cups, Comar expanded AccuCup product line to include both 30 and 60 mL sizes. Companies are making various efforts to expand the business of oral dosing cups to meet increased demands. For instance, in response to increased demand for safe, accurate dosing cups, Comar expanded AccuCup product line to include both 30 and 60 mL sizes. 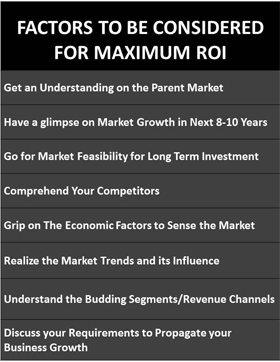 Moreover, companies are focusing on expansion in product mix and product line to discern the growth. The Micro, Small and Medium Enterprises from several regions such as South Asia, South East Asia and Central Asia are concentrated to produce the dosing cups and are fulfilling the demand of the pharmaceutical industries in their domestic market and are also exporting across the globe.